Chefs at two Eastlake restaurants will soon have a much shorter trip to get fresh ingredients: They’ll just have to go upstairs. A new garden, located on a patio one floor above the street, will benefit the kitchens and patrons at Ravish and Sushi Kappo Tamura. The two restaurants are located on the first floor at Ruby Condos in the 2900 block of Eastlake Ave. E.
The patio is actually part of the residential portion of the building. In addition to views of Lake Union, residents at Ruby are now relaxing amidst vegetables that will soon be gracing the plates of restaurant patrons below. The garden was planted on June 25. Chefs Taichi Kitamura and Hiro Tawara from Sushi Kappo Tamura, and Ravish’s owner, Lizbet Mielke, chef Kelly Daly and general manager Nick La Porta were checking out its progress earlier in the week. It will soon be time to start harvesting the garden. A radish was pulled up, inspected and deemed ripe. “I could serve that,” Kitamura noted. Ruby’s patio has had planters ever since the building was completed. Kitamura says the plants, which included ornamental grasses, weren’t doing so great. 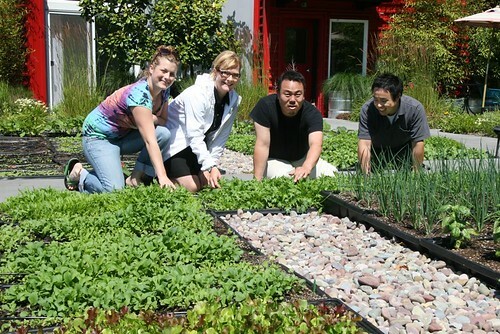 Enter Seattle Urban Farm Company, a firm that designs and builds food-producing gardens in the city and suburbs. 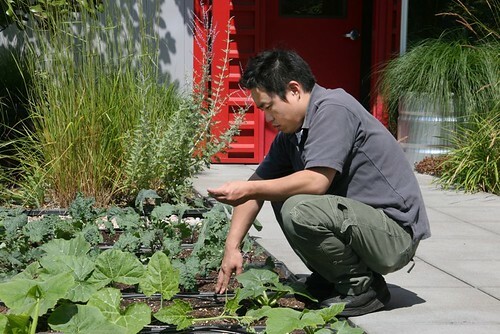 Brad Halm, one of the founders of Seattle Urban Farm, says the company knew Kitamura and thought the patio at Ruby had good potential for a garden. Seattle Urban Farm does a lot of home gardens and has been trying to expand into more commercial projects. They previously planted a rooftop garden at Bastille in Ballard 3.5 years ago that they are still taking care of. Seattle Urban Farm and the restaurants worked with the board at Ruby Condos to create an agreement for use of the space, a process that took about six to eight months. The company then talked with the chefs to decide what vegetables to plant. Seattle Urban Farm did the planting and their staff visits two to three times a week to take care of the garden. They’ll even do the harvesting, although chefs Kitamura and Daly say the expect to make trips to pick items for the evening’s menu. 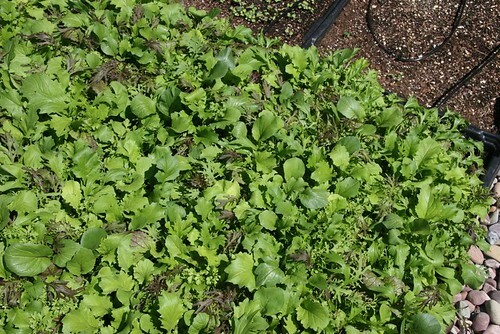 In addition to the radishes, the garden includes squash, greens like chard and kale, onions, chives, beets, lavender and herbs such as sage and thyme. One unusual plant is shiso, which Kitamura describes as a sort of Japanese basil. There’s also a part of the garden for the homeowners that contains a mix of herbs and other plants. The chefs say they’re excited about the potential for the produce from the garden. “Whatever will grow here, I’ll cook with it,” Daly says.